MIRONEKUTON® ミロネクトン Mineral Stone/Mineral Powder with over 66* minerals & trace elements! The original japanese Mironekuton® contains the full strength of nature. 100% natural deep-sea mineral stone without any additives. The original Mironekuton® from Japan, only found in a single region there, is exceptionally rich in natural minerals and trace elements. Due to its manifold beneficial characteristics it is highly popular with Japanese shrimp breeders and plant tank keepers, especially in combination with soil subtrates, as it significantly enhances the all-important microbiology (bacteria, accompanying fauna). Millions of years ago, the remains of fish, plankton, algae, seaweed and other marine organisms sunk to the bottom of the sea, where they were metabolised by microorganisms, and under the special environmental conditions in this region working hand in hand with the high pressure exerted by tectonic faults on the Pacific Plate this singular material consisting of more than 66 different minerals was formed. What purpose do minerals and trace elements serve? Minerals and trace elements are essential for all organisms as they play an important part in many metabolistic processes and are crucial for the production of enzymes (e.g. in the moulting process of dwarf shrimp). A lack of the essential minerals will result in deficiencies, problems and even diseases. Mironekuton® serves as an important mineral depot and creates the most favourable conditions for bacteria (in the ground). These bacteria do not only make the largest part of the minerals available for plant roots but are also important food, e.g. for baby shrimplets and other small organisms. Another part of the minerals is directly taken up by your tank inhabitants or dissolves in the water and is then distributed in the water column where it is available for them. By the way, the body is unable to produce minerals, they must be ingested actively (e.g. in the food) or passively (e.g. through the skin or exoskeleton). The all-important small accompanying fauna organisms that provide for a good and stable water quality and serve shrimp as food are very sensitive to mineral deficiencies, so are young shrimplets. When undersupplied, the small organisms die off or don't even develop in the first place, shrimplets don't survive, and adult shrimp suffer from moulting problems and periodically die. Often, the role quality and quantity of microorganisms play in successful shrimpkeeping and breeding is grossly underestimated. In the tanks of successful breeders you can see a multitude of different living things on the ground. 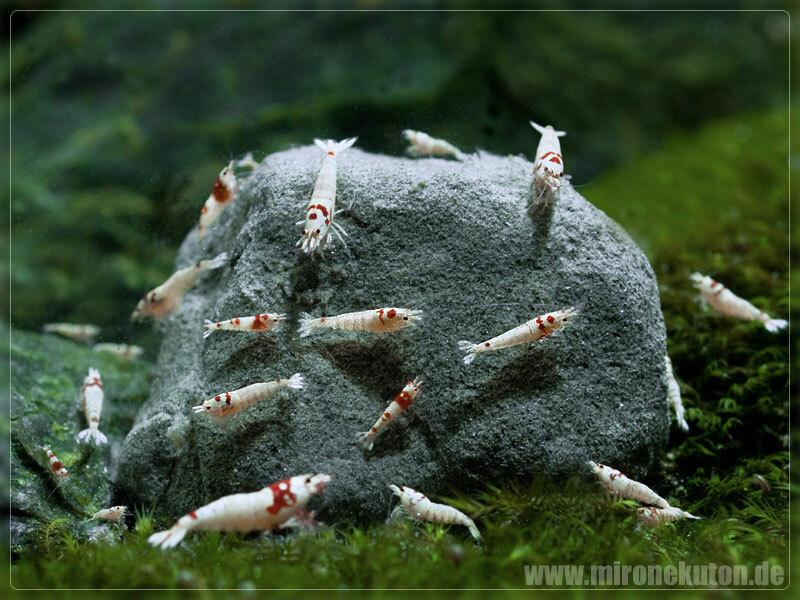 If this is given in a tank and if the mineral supply is good, the shrimp show a much better colour intensity, are more agile and reproduce in higher numbers. These small critters like e.g. copepods (Cyclops) and ostracods are brought into almost every tank with new plants, animals, food, etc. Ideally, large numbers of them should be found on the ground (please use a magnifying glass if necessary). They are a sign for high-quality water, sufficient minerals and food, which are more important that excruciatingly adapted water parameters. If there are no or only very few of these little critters there, often the conditions on and in the ground are less than optimal, so that baby shrimp have little chances to survive. Typically, they die around 7 to 14 days after hatching. Mironekuton® prevents this and provides them with a favourable soil milieu where small organisms and thus also shrimp offspring develop nicely. 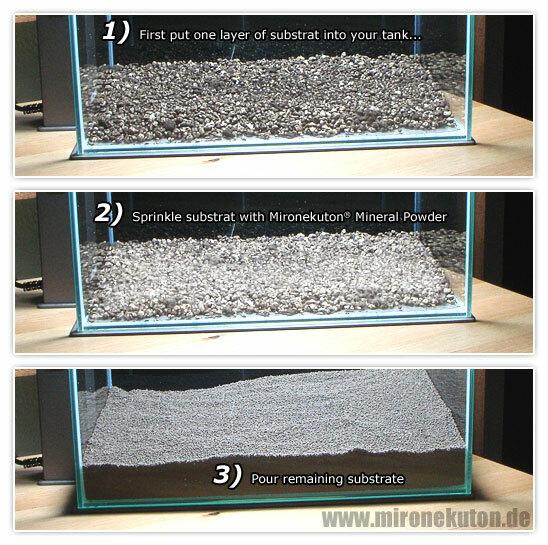 Die Mironekuton® Mineral Stones are simply placed in a tank and serve as mineral depot always avaiable for all the aquarium inhabitants. Alternatively, the stones can be put into the filtering tank or in the external filter. Copyright© 2014 www.mironekuton.de | www.garnelenhaus.de - All rights reserved. Product information, online shops and reseller for Mironekuton®/Mironekton Natural Deep Sea Mineral ミロネクトン Mineral Powder and Mineral Stones. Mironekuton® is a registered trade mark. Natural Deep Sea Mineral ミロネクトン Mineralstone and Mineralpowder.